The Postal Service of Aruba began operating on August 1st 1892, at this time Aruba was part of the “Colony Curaçao” Postal Service with its central directorate positioned in Willemstad, Curacao. The first postal activities on the island consisted of sending and receiving mail (letters, parcels, etc) from boats originating from Curaçao and sometimes from Venezuela. Garibaldi Cephas Helder took care of the handling of the boats carrying mail. The mail had to be picked up at the post office after Garibaldi had announced the arrival of the boat at the harbour of Oranjestad, mouth to mouth while ringing his bell. People used whatever means of transportation they had available to pick up their mail – horses, donkeys, boats, but mostly on foot. The Dutch Colonies of which Aruba was part of, is a member of the Universal Postal Union since 1878. On January 1st 1986 the postal service of Aruba entered the Status Aparte within the kingdom of the Netherlands and became an independent postal service, and together with the Netherlands Antilles remained a member of the Universal Postal Union (UPU). The government of Aruba recruited the assistance of the Dutch consultancy firm Berenschot to advice, help and formalize a postal service in Aruba, so that it could face the Status Aparte as an autonomous service within the Kingdom of the Netherlands. An internal committee of the Postal Service, consisting of Robert S. Arends, Candido F. Dijkhoff (†? ), Rudolf R. De Kort and Michael F. Croes, was formed to help achieve this. The autonomous status of the Postal Service in the UPU brought with it that all the acquired rights and obligations on both local and international level, had to be observed by the Postal Service of Aruba itself. 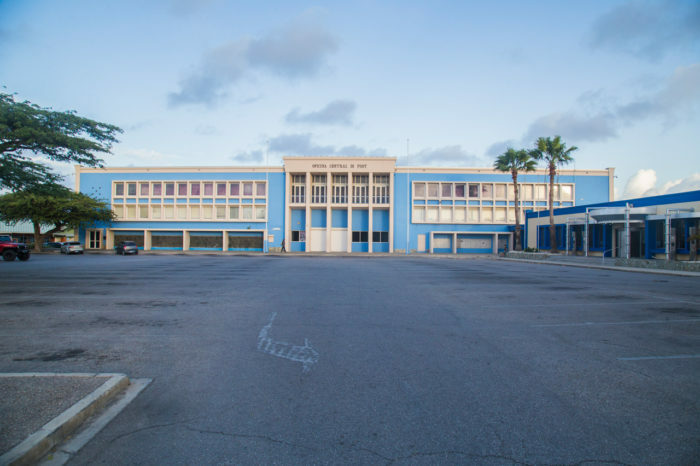 From the onset of the Status Aparte, Aruba lobbied to become a member of Union Postal de las Americas, Spain and Portugal (UPAEP) together with the Netherlands Antilles and this was finally achieved on June 21, 1993. The first official location of the Post was at the office/home of Governor Jacob A. Thielen on what is now known as Plaza Daniel Leo, but it has moved to numerous different locations – Fort Zoutman and what is now known as the Foreign Affairs Office are just two examples. In 1958 the main post office was moved to J.E. Irausquin plein # 9, and has remained there till now. The building was designed by the Manager of the Department of Public Services, Mr. A.A. van Ammers. The building reflects the design elements of earlier decades, namely 1930 – 1950. On September 1, 2005 Post Aruba N.V. was privatized. Through privatization our main goal was to become an integrated company, not only delivering letters and parcels, but offering a broad variety of new products while playing a key role in all communication needs on the island. As well, the initiative was launched to increase the efficiency of all operational processes, and to provide new services, while maintaining high international standards.